Although quite common, and more prevalent with aging, tremor is not a normal consequence of growing older. There are numerous causes of tremor, and this symptom alone may not represent a neurological disease or a serious problem. Treatment, if necessary, is dependent upon the cause of the tremor. 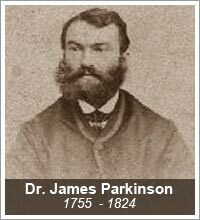 Described first 180 years ago in 1817 by Dr. James Parkinson, a London physician, it has the attention of researchers around the world, but the cause of this neurological disease remains elusive. Parkinson's disease may produce a great variety of symptoms, but the four basic, so called 'cardinal signs' include tremor, slowness of movement, stiffness of movement, and impairment of balance. There is no test for Parkinson's disease; the diagnosis is established by listening to the symptoms and physical examination by an experienced clinician. As of yet there is no cure, but there are numerous therapies that help the symptoms. There are other neurological disorders that bear some resemblance to Parkinson's disease in the symptoms they produce, but on closer examination are distinct from Parkinson's disease on a clinical basis, as well as in the brain changes found. Examples include Progressive Supranuclear Palsy (known as PSP, also referred to as Olszewski-Steele-Richardson syndrome), Multiple System Atrophy, and Cortical Basalganglionic Degeneration. Treatment of these syndromes is with some of the same medications used for Parkinson's disease, although the response is often less satisfactory. This term is used to describe involuntary muscle contractions that produce abnormal postures or movements. In adults, dystonia most commonly affects the head and neck area, causing head turning or shaking (sometimes referred to as torticollis), or involuntary closing of the eyes (blepharospasm). Torticollis is the most common adult form of the disease. The National Spasmodic Torticollis Association, a non-profit organization, serves as clearing house for informations about scientific breakthrough and support group for patients with torticollis www.torticollis.org . Dystonia may affect almost any body part, and often is initially apparent during a specific movement. They result from an abnormality in an area of the brain called the basal ganglia where some of the messages that initiate muscle contractions are processed. Scientists suspect a defect in the body's ability to process a group of chemicals called neurotransmitters that help cells in the brain communicate with each other. Although some of the dystonias are caused by another disease and therefore called secondary dystonia, the majority cases of dystonia are called primary or idiopathic dystoniahave as they have no connection to another disease or injury. Of the primary dystonias, many cases appear to be inherited in a dominant manner; i.e., only one carrier parent need contribute the dystonia gene for the disease to occur. Each child has a 50/50 chance of being a carrier. In dystonia, however, a carrier may or may not develop a dystonia. Sometimes the symptoms are so mild that they are missed. The symptoms may vary widely even among members of the same family. This is due to the so-called low penetrance. That means low appearance of the symptoms despite the presence of the gene. The product of one defective gene appears to be sufficient to cause the chemical imbalances that may lead to dystonia. Tthe possibility exists that another gene or genes and environmental factors may play a role as well. As dystonia is a symptoms, it could be caused by different diseases and in idiopathic dystonia by different genes. In the last year, different genes have emerged as the cause of different types of dystonia. Physicians use a variety of therapies aimed at reducing or eliminating muscle spasms and pain. In recent years these symptoms have been successfully treated in many cases by injecting botulinum toxin (known as Botox) in a controlled manner into the contracting muscles in order to partially relax them. This disorder is a neurological disease resulting in spasm of the vocal cord. It is also called laryngeal dystonia. The patient's voice is marked by spasm. Speaking over the phone is especially difficult. The patient can scream, whisper and laugh aloud. The treatment of choice is injection of botulinum toxin into the vocal cord. The desire to move the legs in association with unusual or uncomfortable sensations deep within the legs, usually in the calves; in some cases the arms may also be affected. The sensations are usually described as creeping, burning, tingling, cramping, aching, pulling, crawling or water flowing deep within the affected extremities. Motor restlessness in a response to or an effort to relieve unusual sensations or discomfort. Symptoms become worse while at rest and may be temporarily diminished by voluntary movements of the affected limb. Symptoms occur most frequently during the evening or early part of the night (for example, between 6 p.m. and 4 a.m.) and often interfere with sleep. This disorder is sometimes associated with a related condition called periodic leg movements of sleep (PLMS). Interestingly, the symptoms are often treated with the same medications used for Parkinson's disease, although no relation between the two has been established. Motor tics are repetitive, usually quick movements that can usually be suppressed by the person who has them, at least for a few seconds. They are not a nervous habit, but are believed to be neurological in their origin. Tourette syndrome is the name applied when motor tics associated with vocal tics (such as throat clearing, or uttering words or fragments of words) begin in childhood, last longer than a year, and change over time. Most people who have Tourette syndrome do not have the famous symptom of uttering obscenities. Tic is common, particularly in childhood, and may improve or cease altogether as one grows older. Occasionally it is sufficiently troubling that medication is warranted. Teasing from other children, or misunderstanding and criticism from parents and teachers are sometimes more problematic than the tic itself. This refers to quick, unpredictable, involuntary movements that seem to jump from one part of the body to another. There are numerous potential causes of chorea. It may occur secondary to a bacterial (streptococcus) infection, rarely in pregnancy, metabolic or hormonal disorders, and Huntington's disease, a rare, inherited neurological disorder. Huntington's disease is a degenerative disease of the brain which is inherited as an autosomal dominant trait. This means that only 1 parent needs to have the abnormal gene to pass the disease on and that about 50% of the children will be affected. Symptoms usually start in the 3rd or 4th decade of life but can begin in childhood or as late as retirement age. The main symptoms are involuntary movements, dementia and psychiatric disturbance. All symptoms worsen over time. Although there is no cure, there are useful treatments for many of the symptoms. The recent discovery of the abnormal Huntington's disease gene has led to the development of a blood test for making a definitive diagnosis in individuals suspected of having this disease. At risk individuals should receive genetic counseling, and neurological and psychiatric evaluation as part of the process. "Tardive" means late, and "dyskinesia" simply means abnormal movement. Tardive dyskinesia is a general term referring to involuntary movements that are induced by medications, usually major tranquilizers, such as haloperidol (Haldol). These movements typically involve the face and mouth, although they may occur in any body part. Myoclonus is defined as sudden lightening jerks. Little is understood about this disorder. The most common cause is post-hypoxic myoclonus as the neurological result of cardiac arrest. Myoclonus could be caused by a variety of disorders. Therapeutic treatment is often inadequate. Recently an animal model has been developed to study this disorder.